The MX100 is an essential accessory for your vehicle to be able to navigate, listen to your favorite tunes and charge your phone all at the same time for convenient and safe driving. 360° Degree Rotating Flexible Gooseneck Rotating Clamp - Adjustable holder to view your device at any angle or orientation while driving. USB Rapid Charger - Charge and connect any compatible USB electronic device. FM Transmitter - Allows you to transmit audio or music from your electronic device to any radio frequency or station from 88.1MHz - 107.9MHz. The LED display indicates which station you are currently using. The MX100 will fit MOST power outlets. Please note that the power outlet for each vehicle is different in terms of size, placement and power output. You may find the MX100 not suitable for your vehicle. If you are having difficulty installing the unit or find the MX100 does not suit your needs, please contact us at Alpatronix Customer Support. We'll be more than happy to make an exchange/replacement or provide you with a refund. Satisfaction Guaranteed: We offer a 2-YEAR hassle-free warranty to ensure long-lasting coverage and protection! 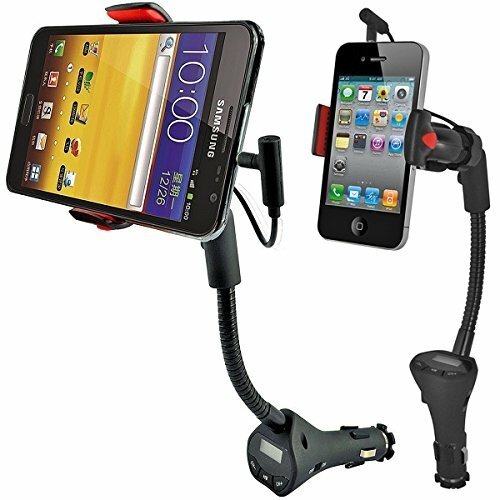 UNIQUE 4-in-1 DESIGN: Car mount holder with dock station features a 360° degree rotating gooseneck clamp for multiple viewing angles and best orientation. This car cellphone holder features USB charging port, car phone mount holder, built-in microphone and FM transmitter for audio and music streaming through your existing car stereo system. UNIVERSAL COMPATIBILITY: Works with all Apple iPhones: 7 Plus/7, 6S Plus/6S, 6 Plus/6, SE, 5C, 5S, 5; Samsung Galaxy S8+, S8, S7 Edge, S7, S6 Edge+, S6 Edge, S6, S5, S4, S3, Note 5, Note 4, Note 3, Note 2 and other Android smartphones. AUDIO TRANSMISSION: An excellent car mount that easily connects to your existing car cigarette power outlet. The FM transmitter uses an LED display to show and indicate radio frequency/station (88.1MHz - 107.9MHz). You can transmit audio through your existing car stereo system by tuning into the same frequency station displayed on the LED. CONVENIENCE IN MIND: Built-in overcurrent protection guards your device battery against any overcharge damage. Built-in USB charger allows you to charge you smartphone or any other mobile electronic device that uses a USB port. The built-in microphone allows for handsfree calling for safe and convenient driving. 100% CUSTOMER SATISFACTION: Multi-purpose car phone holder & cell phone docking station is recommended for vehicles with a vertical or 45° degree angle power outlet. We don't recommend it for vehicles with power outlets that are positioned horizontally. 2-YEAR exclusive warranty ensures you are protected for 2 years of this product and 30-DAY MONEY-BACK GUARANTEE offers peace of mind, enabling you to return the product in case you don't like your purchase for any reason.